The MAST team has released a new version of the Discovery Portal. Highlights include faster, direct access to public and proprietary HST data as well as a redesigned download basket. User Login: There is now a login panel in the upper right corner of the page (Fig 1). You may now access your proprietary data using an existing authorized MAST account (MyST). Future software releases will include user customization, preference saving, search history and more. Figure 1: Top of the MAST Discovery Portal homepage showing the login panel in the upper right corner. Figure 2: Redesigned download basket for the MAST Portal. Questions and feedback about the MAST Discovery Portal can be sent to archive@stsci.edu or posted on the MAST Forum. MAST is now hosting a new set of more than 1 million ATLAS9 model stellar atmospheres. 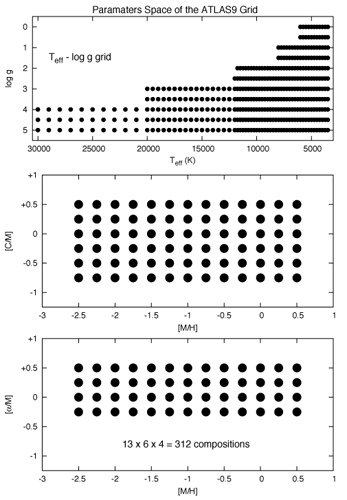 Figure 1: Parameter space of the BOSZ models in effective temperature/log(g) space (top), carbon abundances (middle), and alpha element abundances (bottom). Figure from Bohlin et al. (2017). BOSZ is a collection of new ATLAS9-APOGEE model atmospheres, spanning a wide range of effective temperatures, surface gravities, metallicities, carbon abundances, and alpha enrichment levels (see Fig 1). More than a million models are available to download through the project’s HLSP page: https://archive.stsci.edu/prepds/bosz/. A paper describing the simulations and comparing to HST standards and LTE grids from Castelli and Kurucz is now public: Bohlin et al. 2017, AJ, 153, 234. The models cover wavelengths 1000 Å < λ < 32μm. Most of the parameter combinations are available, but a small subset is still being calculated and ingested into MAST. See the HLSP page for instructions on how to search for models using our web form. Pre-packaged bundles will also be made available once all the models are ingested into MAST. Questions about the MAST archive of the BOSZ data can be sent to archive@stsci.edu or posted on the MAST Forum. The HST-3C team has delivered a custom-reduced series of HST Wide Field Camera 3 observations of 22 high-redshift 3C radio galaxies. The science-ready FITS files are now available from MAST. Figure 1: HST WFC3 optical and IR observations of a subset of the Hz3C sample shown with overlain radio maps. From Hilbert et al. (2016). Hz3C is a collection of multiband HST Wide Field Camera 3 (WFC3) observations of 22 high-redshift (1 < z < 2.5) 3C radio galaxies in the rest frame UV and IR. Science-ready images in the F606W and F140W FITS images are available from MAST at the Hz3C website (https://archive.stsci.edu/prepds/hz3c/). These images were produced using a custom data reduction strategy to remove cosmic rays, persistence signal, and other artifacts. Figure 1 shows a sample of four Hz3C galaxies. A discussion of the sample selection, data reduction approach, and a comparison of the HST data to archival VLA observations can be found in Hilbert et al. (2016). Questions about the HST data products can be sent to MAST at archive@stsci.edu or posted on the MAST Forum.